The athleticism and technique of the swimming talent on show at the Commonwealth Games in Delhi represents the elite level of a sport that equally can be enjoyed competitively at national or county level, or simply as a recreational activity that brings together family or friends. 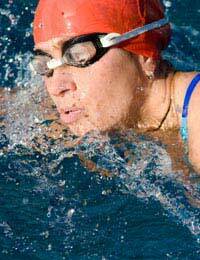 Swimming also represents an ideal way to improve cardiovascular fitness and muscle tone. More importantly, swimming should be viewed as a life skill; one that every individual, young or old, should master because in certain situations it can represent the difference between life and death. So whether you are an adult desperate to conquer your fear of the water, or a parent eager to see junior learn the basics as quickly as possible, what can you expect when you take the plunge and book lessons? “Getting [pupils] to feel completely confident and at home in the water through the use of games and fun activities, each of which has a specific purpose,” says Wendy Dalton, a lead tutor from Devon. Cardiff-based instructor Julia Jarvis also stresses the importance of confidence. “Some children, their inner character is, give it a go. If you say,’ blow bubbles or put your face in the water’, they’ll give it a go, but there are other children [who are more tentative] because of past experience - they’ve fallen in water or their parents have told them water is dangerous. Safety is crucially important – “It’s got to be your number one priority,” says Jarvis. So what procedures are in place? Teachers and coaches accredited by the Amateur Swimming Association (ASA), the governing body for the sport in England, follow Pool Safety Operating Procedures as well as a code of ethics. “The ASA have issued guidance documents on every imaginable topic,” says Dalton. With so many swimming courses on offer, the choice can often be bewildering, but a rule of thumb is to find one affiliated to the national association. In England, for example, that means choosing an ASA approved centre that follows its National Plan for Teaching Swimming (NPTS). “Talk to the swim co-ordinator and ask what feedback you can expect; will there be written reports at the end of the block? ; will you be able to talk to the teacher about your child’s progress, or to the co-ordinator?” says Dalton. Another good indicator of the standard of instruction, says Dalton, is to observe a lesson in progress. “Look at the faces of those being taught. Are they happy, attentive, smiling, do they look confident and relaxed in the water? How much time do they spend actually trying out various skills and strokes and how much is spent at, or on, the side listening and looking at the teacher? Remember, most people will learn by doing. Talk to other parents. Comprehensive information on all aspects of the sport can be found at the ASA’s swimming.org site. The association has also underlined its commitment to coaching development with the launch of a new web-based education and training initiative through the Institute of Swimming.